Need a good attendance tracking system so people coming to work can easily check in and out? 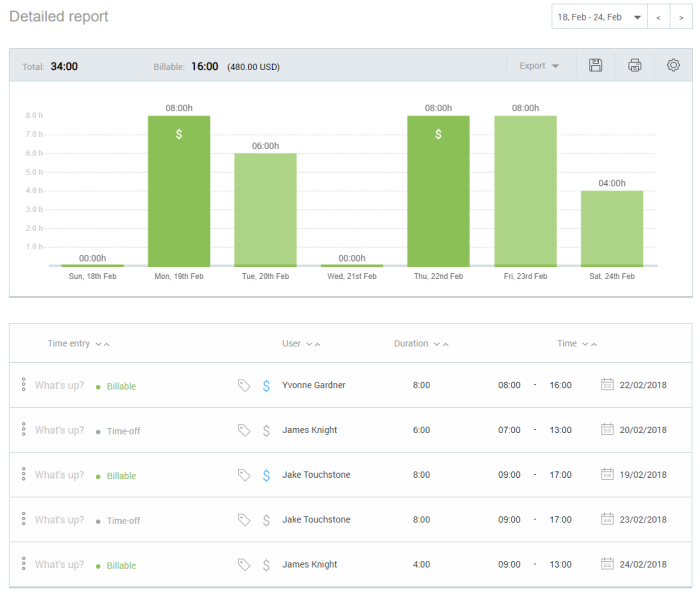 Here are two simple ways you can track attendance and duration with Clockify. The simplest and the easiest way to set up an attendance tracking system for check-in check-out. Put the tablet near the entrance/exit. When people come in, they record their attendance with a few taps on the tablet. If you have all sorts of people coming in and out, they can just write their name in the description field, set start and end time (which they can later update). It’s all very simple and quick that can be done in less than 10 seconds. If you have a less chaotic schedule and more consistent set of people, you can create a project for each person and enable the timesheet. Then, a person can just select themselves and fill how long they’ve worked under the appropriate day column. This approach requires a bit more set up, but then people don’t have to queue for the tablet and can log their attendance and hours themselves when they have the time. Go to Teams page and enter emails of people who will track their hours. people will get an invitation to create a Clockify account and join your workspace. 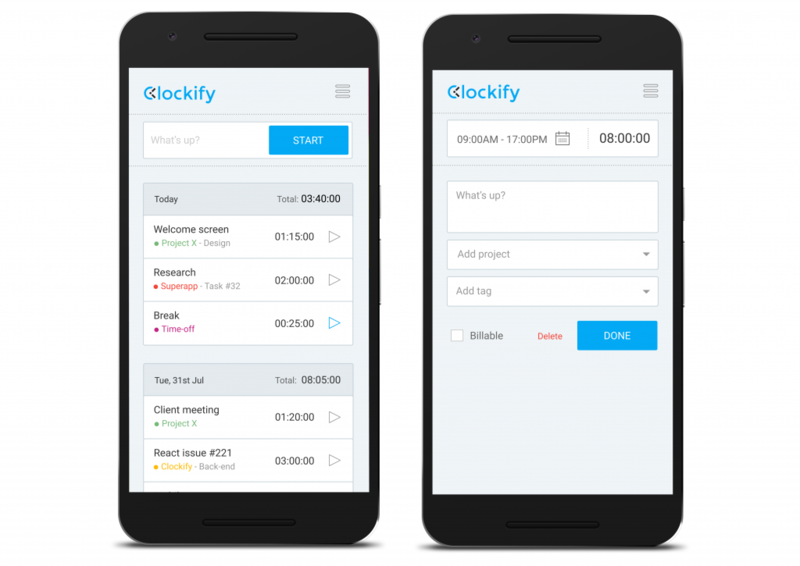 Once a person accepts your invite, they can log in into Clockfiy via their browser (don’t have to install anything and can log in from anywhere), and create time cards or log hours in their personal timesheet. If you want to make it even easier, you can just have them install the mobile app and track time from there (available for Android and iPhone). How to account for breaks? You can have a “Breaks” project so people can create a separate time card for their breaks and associate them with the “Breaks” project. How to track overtime work? If you need to see what time entries were created for overtime work, you can create an “overtime” tag. Then once someone’s regular hours are finished, they can attach the “overtime” tag to all of their subsequent time entries. If people use the timesheet to enter their work, they can switch to the time tracker and there add tags and notes to the appropriate entries. 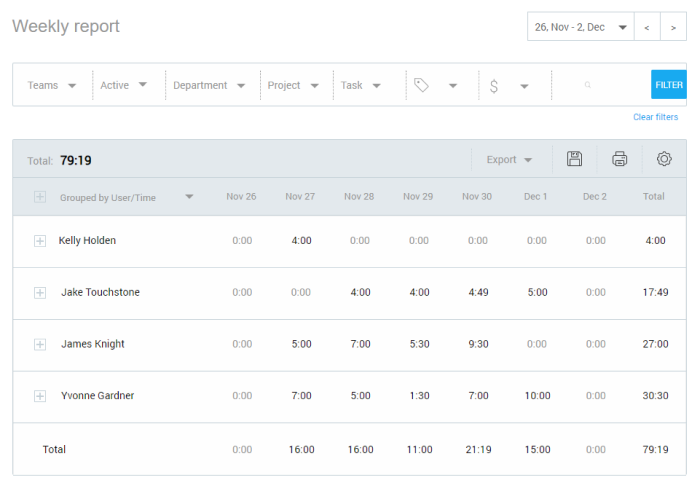 Later, you can run a report and group time by User/Tag and that way see who has how much overtime. 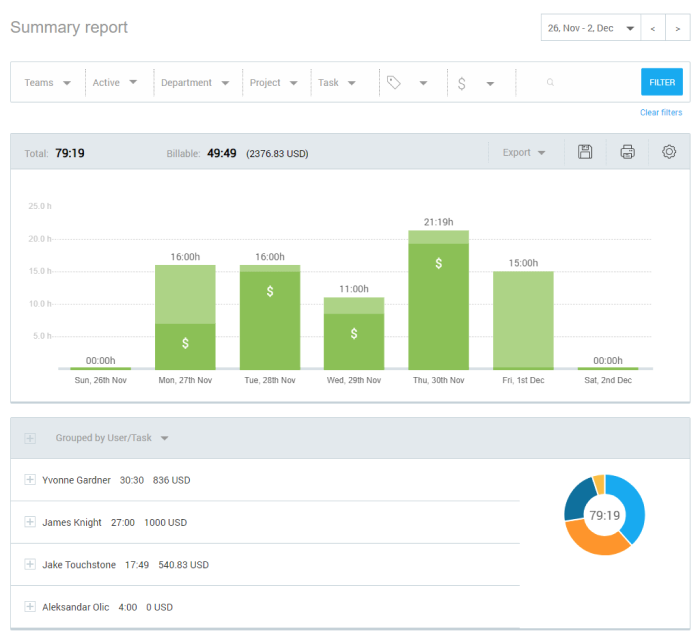 You can also see in Detailed report which entries exactly were created for overtime work. If people forget to tag their entries as overtime, you can set up automatic reminders. Simply set targets (eg. 8h/day) and when someone logs more time than their target, they’ll get an email. As people submit their hours, you can see who worked and how long in reports. In the Weekly report, you can see attendance broken down by person, day, and duration for each day. In the Detailed report, you can see all individual time cards and filter them by day (and edit if necessary). In the Summary report, you can see time totals broken down by project, person, time period, and more. So what’s the best way to set up the clock-in-clock-out system? The best check-in check-out system depends on your business needs and your employees. If you’re in a fast-moving environment and don’t want to bother people app installation or asking them their emails, setting up a clock-in-clock-out station on your tablet is the best. 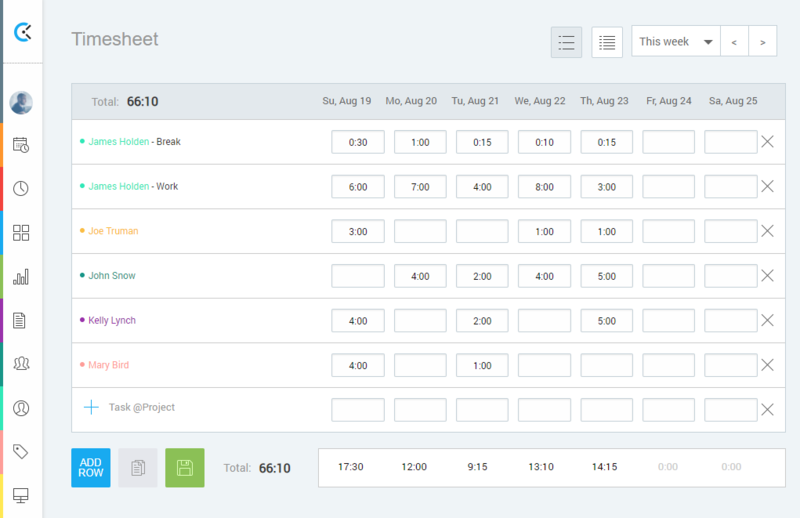 If people are coming to work every day and work at their computers, you can invite them as users in Clockify and they can personally log their hours at the end of the day by either filling their weekly timesheet or by creating time cards with start/end times. If you need a more granular level of details, you can also create tasks (subprojects which will list types of activity).